You can now learn Hebrew with an Alexa Skill. If you have the Amazon Echo, Amazon Dot, or Amazon Fire TV, you can go to the Amazon skills finder. Skills are free to enable and use with your Alexa enabled device. Version 1 of this Alexa skill was launched Dec 8, 2017. Alexa is an amazing voice-enabled home device that you can talk to. You wake it up by saying it's name (Alexa). You can ask it questions, like "What is the weather?" and "How old is Morgan Freeman?". Alexa opened up the platform by allowing software developers to create custom skills. Skills can be searched and browsed on the Amazon site; they are somewhat similar to apps that you install on your smart phone. At this time, all skills are free. Once you install "Hebrew Garden - Biblical Hebrew Word Vocabulary", here are some commands to get you started. 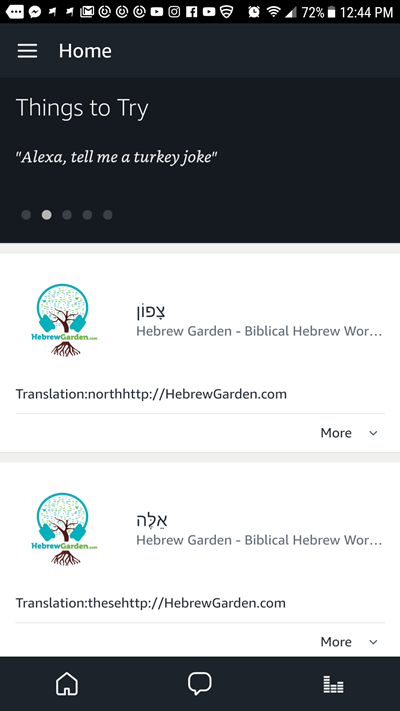 Alexa will tell you a random Hebrew word from our database, then tell you its English meaning. 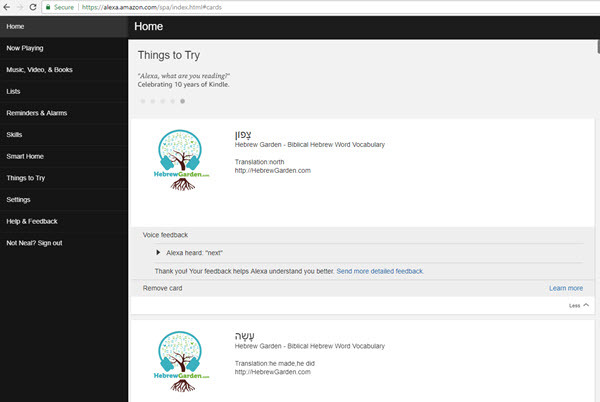 Alexa will select 5 random words Hebrew word from our database, then tell you the word. (If you like Jeopardy style, you can also say "What is ____ " or "Who is ____". Note: When Alexa teaches you a word, it might give you 1 to 4 English meanings. When you say "Answer is ________", you only need to give any one of those meanings. Alexa will give you the basic options as listed above. You can set the range of words you want to learn and be quized on. For example, the first week, you say "Set Range from 1 to 20" to learn just the first 20 words. The next week, you could say "Set Range from 10 to 30" to keep reviewing words 10-20 and start learning words 21-30. When you are in "teach word" mode, words are randomly selected from our database of the Top 400 (most frequently used) Words of the Hebrew Bible. If you want to learn them in order from most frequent first, you need to set the range. In Version 1, Alexa doesn't remember the range you have set; so you have to keep track and set the range each time you use the skill. With success, Version 2 will be much smarter. Proper names are places and names of people (typically begin with a capital letter in English). By default, these words are included (Proper Names On). But if you want, you can turn them off. The system defaults to 5 questions per quiz, but you can override that to any other number by saying "quiz size 10", or whatever number you want. By defaults, cards are set to "off". Cards are like notecards that can be optionally created and displayed on the site: https://alexa.amazon.com or on your Alexa smart phone app. The first version does not store your results or the above options across sessions. The next version will probably be adaptive. That means it will learn which words you have trouble with, and drill you on them more often. I'm also thinking about teaching some of the verb binyanim (conjugations) in a future version of the app. Now, in addition to learning the vocabulary, we can teach you how to pronounce and read the letters, and teach you some basic grammar. Sign-up as a member of HebrewGarden to keep learning. Please give me your feedback and help improve the Alexa Skill. Facebook page: https://fb.me/HebrewGarden - You are welcome to join this group/page an interact with other fellow students.